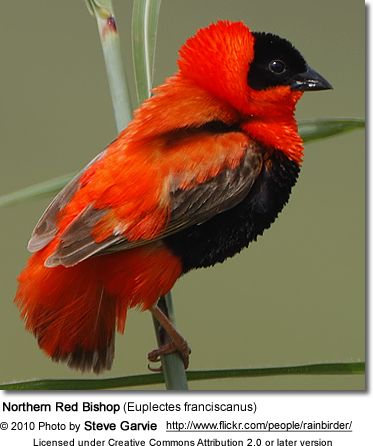 The Orange Bishops (Euplectes franciscanus) - also known as Franciscan Bishops, Northern Red Bishops or West Nile Red Bishops - are African finches that are best known for the males' habit of weaving complex dome nests, as well as their entertaining displays to attract potential females. They occur naturally south of the Sahara Desert and north of the Equator. South of the Equator, these weavers are replaced by the related Southern Red Bishop, of which they were formerly believed to be a sub-species. In the wild, these social birds nest in colonies, and they generally roost and forage in flocks - often together with other members of the weaver family. Northern Red Bishops occur naturally in southern Mauritania, Senegambia, Guinea-Bissau, Guinea, southern Mali, northern Sierra Leone, northern Liberia, Burkina Faso, northern Ivory Coast, Ghana (mostly inland, but locally also along the coast), Togo, Benin, southwestern Niger, Nigeria (primarily north of the great rivers), southern Chad, northern Cameroon; northern Central African Republic; Sudan (particularly along the Nile River and its tributaries), west and northeastern Ethiopia, western Eritrea and northwestern and southern Somalia, south to northeastern Democratic Republic of the Congo, northern Uganda and western Kenya (along the lakes Baringo and Bogoria). Introduced birds have established themselves in southwestern United States (near Los Angeles, in California), on Puerto Rico, on Martinique and Guadeloupe in the West Indies. They are also reported on Jamaica and St. Croix in the Virgin Islands, and potentially in Japan. This common weaver occurs in a range of open country, especially tall grassland and often near water. Abyssinian Orange Bishop (Euplectes franciscanus pusillus - Hartert, E, 1901) - some authorities consider this race invalid and incorporate it into the nominate form. ID: Chest less red colored and the plumage is more orange-red, rather than red. Longer tail coverts (feathers) that sometimes cover the entire tail. However, these physical characteristics are variable throughout the range. The Northern Red Bishops are stocky, sparrow-sized finches that measure about 5.1 - 5.9 inches (13–15 cm) in length, including the tail. They come in two color phases depending upon the season. Plumage is scarlet apart from his black head and waistcoat, and brown wings and tail. The conical bill is thick and black. Plumage is mostly pale yellow-brown, streaked above and shading to whitish below. He has a buff supercilium (line above eye). The thick bill is conical in shape and black. Females are similar, but smaller. Juveniles resemble the non-breeding males and females, except they have wider pale fringes on their flight feathers. Rarely, young males have been reported to molt into their adult plumage at the early age of one year, but in most cases, they are 18 months to two years old. Easily confused with breeding males of the Southern Red Bishop - but the Northern Red Bishops can be identified by their red throats, and the black patch extending further back on the crown and below the bill. 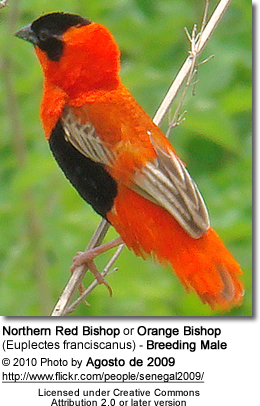 Females, juveniles and non-breeding males are identical to those of the Northern Red Bishop. The Black-winged Red Bishop or Crimson-crowned Weaver is black below the bill and red above the bill. 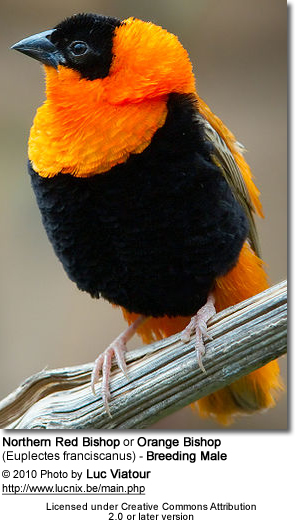 The Orange Weaver / Bishop is black above the bill and orange below the bill. The Northern Red Bishops feed on a variety of seeds, grains and plant food. Those raising young increase the percentage of live food in their diet to meet their growing chicks' demand for protein. A good quality finch seed mix that either includes or should have added to Canary seeds, Millets and Yellow and Red Panicum. Soaked and sprouted seeds provide additional nutrients. A variety of live foods, such as mealworms, crickets, small grass hoppers, small cockroaches, termites and moths, should be readily available during the nesting period. Non-breeding birds are usually less interested in live food. Some fruits (e.g. apple, sweet corn) and some green leafy vegetables can be offered. Preferences will vary and experimenting with different produce will allow you to identify the items they like, and which ones they don't. Some also like soft foods, while others ignore it. This will also depend on what they are used to / have been raised on. Northern Red Bishops nest in colonies with most nesting occurring in late spring to late summer. The male will work on several dome-shape nests each one with a side entrance, weaving them out of grasses and other plant material. The nest is usually suspended between reeds, forked dry brushes, or 2 to 4 strong branches of low trees or shrubs. The male strips ribbons of foliage or makes use of grass-type blades growing in their environment to weave the nest with. As he is building the nests, he also performs display flights and fluffs his feathers to attract females to his nests. Once he sees a preference for one or more of the nests, he will concentrate on those and abandon the others. The females will settle down in her chosen nest and personalize it by lining it with soft grasses, plant material and feathers. The male will mate with several females. The average clutch consists of 2 - 4 aqua-blue eggs, which are incubated for about 14 days. . Even though the female does most of the brooding, the male will assist. They may produce another clutch, or even two, in favorable conditions. The young fledge (leave the nest) when they are 18 - 21 days old and they are independent in another 3 weeks. Northern Red Bishops fare best in large, planted aviaries as opposed to cages. The flight should contain dense, leafy shrubs, tall growing grasses, as well as potted or miniature bamboos - all of which are suitable nesting material for the males to work with. The females will look for soft material to line the nests with, such as cotton wool, soft grasses, feather down and mosses. One male can service several females. Some suggest 3 to 4 females per male, but others report far better breeding results with 2 - 3 females per male. Considering that the male assist the female in brooding the eggs and raising the young, it makes sense to keep down the number of females he has to help. This will give the young a better chance of making it to fledging. Fortunately, provided sufficient food is available and disturbances are kept at a minimum, Northern Red Bishops make excellent parents. Since these finches are generally not aggressive, they can be kept together with other finches of similar size and even smaller birds, including grassfinches or waxbills. However, they generally dislike Golden Song Sparrows and Green Singing Finches, and it is also best to avoid related finch species, such as Orange Weavers / Bishops and Southern Red Bishops, as they will readily hybridize. Some report that keeping two breeding males in a flight promotes competition between them thus stimulating breeding. However, males should not be added to the aviary during the breeding season - particularly not when females are sitting on eggs or raising young as this may interrupt the breeding process, and may even result in eggs and chicks ending up dead on the floor, or one of the males being killed. Occasionally females pull the bottoms out of other nests. If this happens, it's important to quickly repair those nests to prevent eggs or chicks to fall to their death. Non-breeding males are usually very peaceful; however, as soon as they molt into their breeding plumage, they will aggressively guard and protect their nests and surrounding areas. Provided sufficient space is available for all, this usually doesn't cause problems. The less space available for each pair, the higher the risk of injuries (and potentially death) amongst the aviary occupants. The other aviary occupants usually learn to avoid displaying males. During the breeding season, it is recommended to remove non-breeding birds, thus reducing the risk of them being attacked by over-protective males. This will allow pairs to raise their young with less interruption and conflict. Nest inspections are generally tolerated, although some hens are less tolerant than others. Once the young have hatched, the parents will need an unlimited supply of live food to feed chicks with - especially for the first week. At this time, mealworms, maggots, crickets, moths, small spiders and other insects are sought after to feed the chicks with. If not enough live food is available, or if they are disturbed too often, they may abandon their chicks. The Northern Red Bishop's call is described as a thin tsip. Northern Red Bishops have a life expectancy of 12 or more years. The males reach reproductive maturity when they are about 2 years old (although some rare males at the early age of one year). Males molt into adult plumage at the same time as they reach reproductive maturity. Females are able to breed when they are about one year old.